This procedure outlines what you need to know about the more prevalent pest animal species, and how to use this information to effect control of the pests which are relevant to your business. This procedure contains links to the most up to date information on managing vertebrate pest species, to ensure you get the most effective control for investment of your time in controlling these animals. Use the links to further your level of knowledge and understanding of the pest species you are targeting. Without a basic understanding of the key times for strategic baiting and other control agents, and the positive impacts that working in a coordinated fashion can have on decreasing populations, your time may be not spent most effectively. Pest animal control is just one part of an integrated approach to the management of grazing system production and natural resource systems. The approach taken to manage pest animals needs to be carefully planned and coordinated to ensure that maximum benefit is achieved from the effort and cost of implementing the control program. Find out if there are any seasonal local or regional campaigns coordinated towards your target species, and join the group(s) if you are able. Individually, you can maintain constant pressure on the pest animal species, by employing control agents in times of peak activity, other important times (such as lambing), as well as in between times. This could be a simple as having bait stations located along tracks which you use when running waters, that can be replenished and monitored, for the in between times, with a targeted campaign in the lead up to and over lambing time. Sustained pressure can help keep populations at lower levels throughout the year. It is also very useful to track and control the influx of new animals after a major campaign. Depending on the species present, your individual efforts may not be rewarded if there is a high population, and no co‑ordination of controlling the species. Predator control is often more effective when coordinated around a group or district approach with neighboring properties undertaking the control program at specific times. Make all attempts to work closely with neighboring properties to control feral animals where possible. Community pest management groups deliver integrated management programs for wild dogs, foxes and feral pigs in some cases. These coordinated approaches may also be eligible for assistance from industry bodies, natural resource management organisations or government departments. These groups also offer a mechanism to engage individuals who are new to managing pest species in a non-threatening way. In areas where foxes and wild dogs both occur it is advantageous to conduct regular wild dog baiting programs to manage both species. Foxes are natural scavengers and will readily take and be killed by wild dog strength 1080 baits targeted for wild dogs. Wild dogs however require a higher dose rate of 1080 than used for foxes and are less likely to be killed by fox bait if eaten. If fox numbers are high they can also have adverse effects on wild dog baiting programs by taking the baits targeted for the wild dogs. A replacement baiting program using wild dog strength baits will manage this non-target uptake and provide increased control for both species. There is also a need for follow up monitoring and ongoing control efforts to ensure that predator populations are maintained at low levels with a minimum impact on the grazing management system. Be sure to know and adhere to regulations regarding use of control agents for pest species, as different jurisdictions (states) do have different rules. Your local pest management officer will assist you with this. Understand the interactions which may occur that can have negative or positive impacts on control of particular pest animal species. Investing in this knowledge can optimize results, and prevent failed campaigns. The main predator animals found in the pastoral areas of Australia are wild dogs, foxes and feral pigs. Many control techniques for these pest species are effective across more than one pest species, which is a bonus for control programs, especially where foxes and wild dogs are concerned. Make it a priority to understand a little about the biology of each pest species present, and when is the best time in their life cycle to target them for optimum control. Wild dogs and foxes can cause significant impacts on grazing businesses. Wild dogs are a primary predator on young or weak stock, and a significant predator in sheep country. Foxes are most often a secondary predator, preying on animals that are injured, mismothered, sick or similar. Importantly, both of these species require control agents to keep populations down. Feral pigs require much larger doses of 1080 to be killed and therefore can consume a number of wild dog or fox baits before being affected by the toxin. Large numbers of feral pigs can have detrimental effects on wild dog management programmes as they will consume meat baits targeted at wild dogs. Pig numbers should be controlled leading up to wild dog control programmes in order to ensure effective wild dog management. Check with your state pest animal authorities to find out about using ‘pig strength’ wild dog/fox (meat or meat type) baits to overcome the potential for feral pig consumption of wild dog/fox baits during programs targeting these species. In many pastoral regions where grain growing is uncommon, feral pigs will not readily take grain based baits. Harbor diseases that may impact on humans and other animals. Similarly for feral pigs if they are present when targeting wild dogs/foxes. Build proactive control programs into daily or weekly property management activities, such as water runs, etc. Target control in areas such as travel ways and landscape features such as roadways, creek lines, ridges, stock pads and trees plantations, etc. Avoid risks to working dogs by leaving them at home when checking baits or travelling to areas of the property where control is being undertaken, and use muzzles when using working dogs if a baiting program is underway. Seek professional advice to increase your understanding of the relevant techniques and their integration. Wild dog management should be about reducing impacts rather than counting dead dogs. Manage dogs to reduce impacts as eradication is unlikely in many areas. 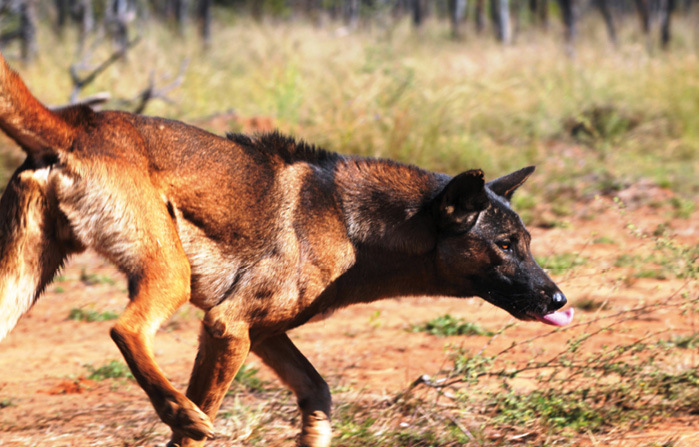 An AWI-funded wild dog control program has contributed to control programs being conducted across 1.3 million square kilometres of country in every mainland State of Australia through 116 wild dog control groups. 85% reported better wellbeing as a result of participating. Given these results, the Board of AWI remains strongly committed to supporting growers facing wild dog predation. Support through the Community Wild Dog Control Initiative continues, as does the provision of coordination of wild dog control at the national and state/regional levels. AWI funds the National Wild Dog Facilitator; Qld Wild Dog Coordinator; Wild Dog Coordinators in Western NSW and the New England region; two Coordinator positions in Victoria’s North East and in the Gippsland; an annual coordination role in South Australia’s Bite Back program; and a soon to be announced Wild Dog Coordinator in Western Australia. AWI provides a comprehensive source of information on their website regarding control of feral predator pests. Non-domestic grazing species are a cost to pastoral areas through the direct competition that they place on the available plants utilised by grazing operations. Not only do the competing grazing species consume pasture that could be utilised by domestic species, they are often responsible for environmental damage. It is also important to consider the native species which also, during certain conditions place significant pressure on the environment and plant material present. A key challenge to the pastoral manager is to minimise the impact of the native species on the grazing operation, keeping the impact to a manageable level, and minimise the number of feral grazing animals impacting on their operation. The role and impact of native species on total grazing pressure is covered in procedure 12.5 Match grazing pressure to feed supply. This procedure covers only wild or feral pest species. Goats arrived in Australia with the first European settlers. Historically, wild goats were considered a significant pest species. In more recent times, an industry focusing on the harvest of goats in pastoral areas has developed, and nowadays, the Australian goat meat export industry is a significant industry and many pastoralists in Australia now consider the capture and sale of unmanaged wild goats to be an important part of their business. The added benefit of this harvest comes from improved natural resource management outcomes that removal of the goats delivers. Specifically, the goat industry in western NSW is becoming increasingly professional and producers are developing production systems that allow improved husbandry, management and increasing control over grazing pressure. Many producers manage the wild goat population on their properties in a similar way to how they manage their domestic animals. Unmanaged goats contribute to the Total Grazing Pressure on a property, and as such, their inclusion in either a management program, or control/eradication program is required, to minimise the negative impacts of their presence on the property. These impacts may arise from increased grazing pressure, to the opportunity cost of mobs moving throughout the landscape and utilising your feedbase, but not contributing to the economic productivity. Because goats, as well as other species of animal, both domesticated and wild, are proven significant causal agents of environmental damage, through soil erosion or pasture degradation, harvest programs are integral in maintaining pastoral land condition, and minimising damage caused by this species. Wild goat herds remain a pest species in both pastoral and non-pastoral areas of Australia. Legislation varies from state to state regarding their control and you should adhere to regulations specific to your jurisdiction. Not all pastoral areas have available an opportunity to harvest these animals in a commercial sense, and as such, control of these in a pest management sense is carried out. The rabbit is a widespread pest species, which has a significant impact on grazing lands across Australia. Their distribution is significant, with the pest being present in all states of Australia, with lower prevalence in the more northern parts of Australia. The rabbit is such a successful pest species because of its high reproductive rate, having the ability to produce five or more litters per year, depending on available food supply. Control measures, as with other pest species, are best implemented through an integrated approach, which targets the species at key times with key practices to offer maximum impact at that time. Feral donkeys can damage native vegetation, contribute to soil erosion and compete with stock for pasture and water. Australia is believed to have one of the largest, if not, the largest wild population of camels, approximately 1 million. They occupy most of Australia’s desert country including the Great Sandy, Gibson, Great Victoria and Simpson deserts, as well as much of the semi-desert lands. What makes them effective pests is their ability to forage over very large areas, up to and exceeding 70 kilometers per day. 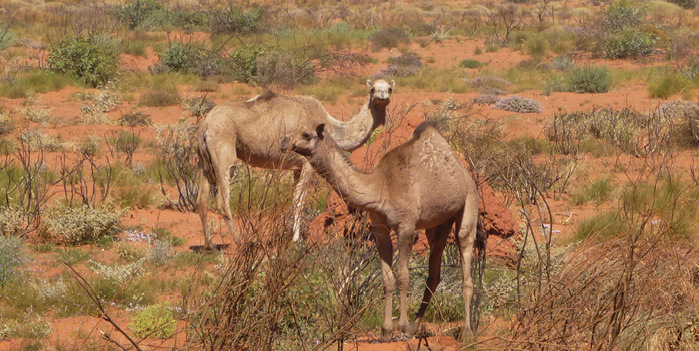 Camels breed every second year, so their fecundity is not what makes them effective pest species. Camels are an effective pest species due to the fact that they can cover large distances, are well acclimatized and they have no predators, aside from culling operations. Camels are selective feeders with a preference for shrubs and trees browse rather than grasses. They can go for long periods without needing to drink, but during the heat of summer they will drink every day if water is available. Camels compete for available feed and water, and may cause extensive damage to fences, important cultural sites and other farm infrastructure. They are also a potential carrier of exotic disease. The Judas approach (with some success). Going into Goats: Profitable producers’ best practice guide to incorporating wild goats into a managed enterprise on your farm.